This challenge will close Friday March 8, 2019. Well, here goes. That's a great image to start with, I might add! What a barn, it has a very cinematic feel to me with the fog so that's the route I took. A touch of colour grading and desaturation trying to emphasise the mood, then a suitably cinema like crop. I decided to fix it up and bring it into the 21st century. 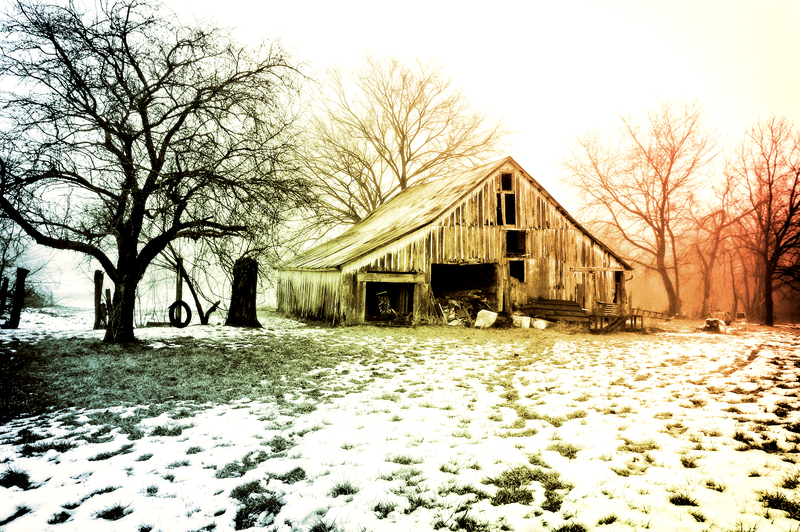 Add my vote to the great barn, great image comments. Here's something a little different. Black and white for me too. Sorry, I am a little late getting this challenge closed. 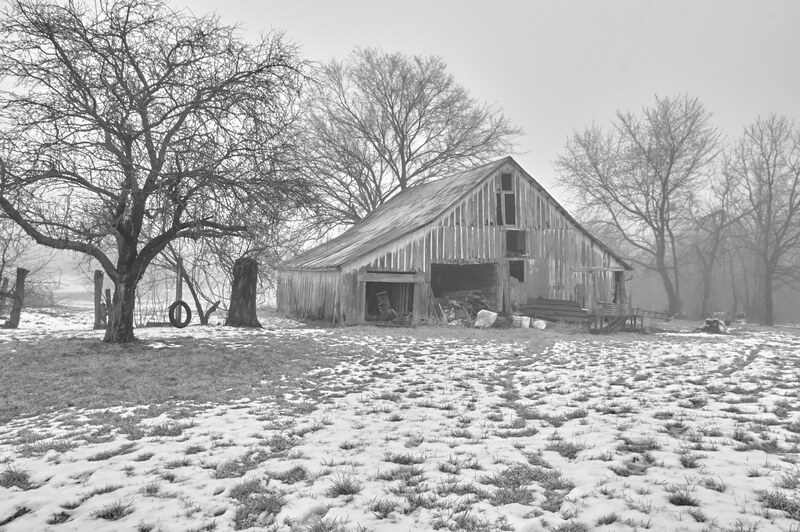 This image naturally lends itself to a black and white process. That is what I did with it as well. photocles - I really like your choice for a crop, contrast and sharpening for the image detail. graeme83 - You choice a crop that gives a panoramic feel to the image and by retaining very subdued color have indeed captured the mood. JHfwp - You have the brightest entry which really emphasizes the fog. I like that you removed the fence post behind the tire swing to make the tire swing more evident. tuggie76 - You obviously have the most time and money invested in your processing! 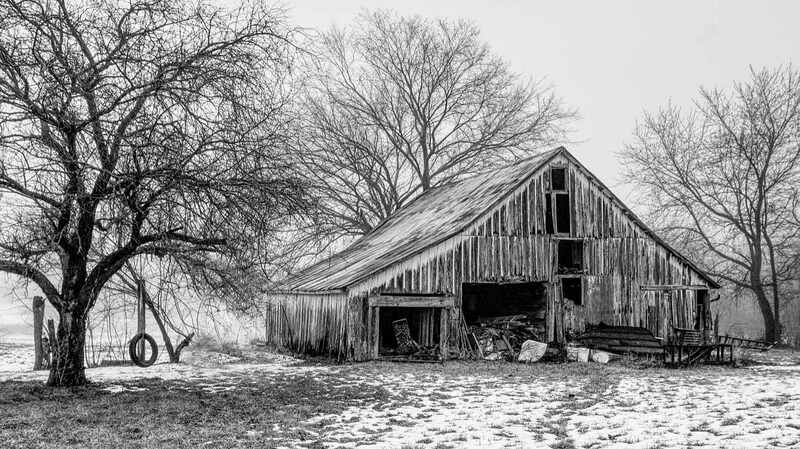 I am amazed you could even get that barn cleaned out in a week and then with all of the repairs and purchase of equipment, you must be exhausted! AggieDad - You brought color to a gloomy day! noelcnm - You are brave! 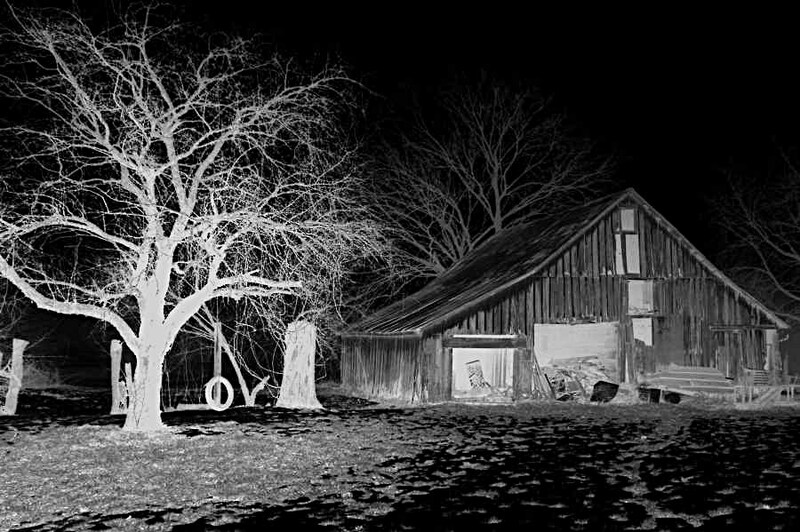 You decided to take an x-ray of that old barn, but I'm not sure I really want to know what is in there. todd - Good use of contrast and sharpening. Nessie - A bright image empasizing the haziness of the day. I want to thank each of you that contributed and continue to support this challenge. It is never easy for me to select a host for the next challenge as each image has its own attributes, but I must, so here we go. The host for #289 will be..................................photocles! Well done photocles! A great image to play with, thank you Glenn, and yes I have way too much time on my hands! Thanks tuggie76 and thank you, Glenn, for hosting last week's challenge. Again, that was a very nice image to play with! Thanks for hosting and commenting, Glenn. Nice job, photocles! Congrats Photocles, I like what you've done with the image. Nice work. Thanks Glenn5995.